That a positive attitude and psychological support can promote the therapy of cancer and even encourage the cure is a widely held view. In this paper the capabilities and limitations of positive psychology and psychotherapy will be discussed with the aid of two studies. The first one has laid the foundation for this research area and the second study replicated the latter using a more appropriate methodology. It will be shown that some assumptions made in recent decades are not more than parts of a myth, which is progressively dissolved by high quality studies. In 1989 Spiegel and colleagues, have published one of the first and still frequently cited studies that reports a relationship between the attendance of breast cancer patients in in-group psychotherapy and their survival time (Spiegel, Bloom, Kraemer & Gottheil, 1989). Since then, many studies with similar results (e.g. Fawzy et al., as described in Coyne, Stefanek & Palmer, 2007) were released. Other researchers and even an entire area in psychology, namely positive psychology, believe apart from this life-prolonging effect in positive outcomes like a better quality of life (Colby & Shifren, 2013) or an improved adjustment to cancer (Mark & Meyer, as described in Helgeson, Cohen, Schulz & Yasko, 2001), which can allegedly be achieved through a positive attitude or psychological intervention. Those assumptions became popular among the general population in the last decades and influence therefore not only the attitude of cancer patients toward their disease, but also the expectation of other people towards the patients. 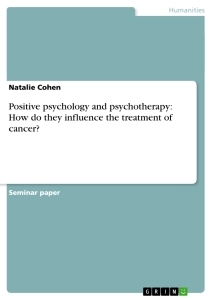 Since there is not only support for the impact of positive psychology and psychotherapy on the cure and therapy of cancer, but also more and more critical studies and meta-analyses of previous studies, the question of the effectiveness and importance of intervention for the patients will be discussed in this paper. To begin with, the advantages of a positive attitude and psychotherapy for cancer patients are discussed, followed by a description of Spiegel and colleagues’ popular study. The points of criticism will be presented and a comparison will be provided by a study, which does not support the above-described point of view. This discussion should provide a basis to show that the assertions of positive psychologists and supporter of psychotherapy’s positive affect on cancer cure are a myth without sufficient evidence and information, cancer patients and their families can not rely on. In the literature about a positive attitude and psychological support for cancer patients several advantages are repeatedly mentioned. Like already described above, cancer patients who report optimism also tend to have a better quality of life (Colby & Shifren, 2013). In addition they are likely to cope better with their disease. The optimism and a positive attitude enables cancer patients to give their otherwise frightening and daunting disease a meaning, which in turn strengthens their fighting spirit and intrinsic goal to overcome the disease (Aspinwall & Tedeschi, 2010). Other effects of a positive attitude are “positive health behaviours, better recovery from certain medical procedures, positive changes in immune system functioning, and improved survival rates” (Aspinwall & Tedeschi, 2010). Anglicisms in the German Newsmagazines "FOCUS" and "Der Spiegel"
Chronic Inflammation as a Risk Factor for Colon Cancer?